Hats, mittens, socks, leg warmers, slippers, sweaters, leggings and sweater-leggings combinations are available in sizes from baby to toddler to older children. 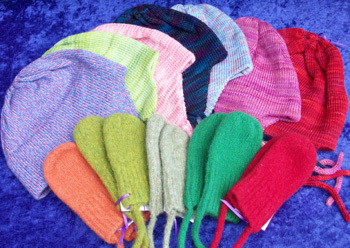 Hats: Baby/Toddler- $40; Children’s sizes-$45. Felted Vests: Baby- $50- $55; Toddler- $60; Child- $65- $85.